If you read my "About Me" page, you might have seen that my parents bought me a casting set when I was 18 as a consolation prize after a break up with my boyfriend—a kit that I still have today. Lost wax casting is a technique that's been around for thousands of years. A model is created from wax, placed into a type of high-temp plaster material, then the wax is burned out under high heat leaving a cavity, and molten metal is poured into the mold. When the metal has cooled, you have an exact replica of the wax model cast in metal. But there was something I'd struggled with. I'd never learned anything about how to carve wax...or carve wax correctly. Did you know that there are many types of wax available? Sure, I'd noticed that there were different colors, and I kinda understood that one wax seemed softer than another, but I was missing something. I just didn't get it. I'd bought every color of wax known to man, bought several books—including one expensive out-of-print book—but I'd gotten nowhere. Those colors were a mystery. And I have the equipment. A Kaya-Cast vacuum casting setup. All 88 pounds of it, even hauling it back to Austin from Denver. Buying the right equipment is surely the key, right? Nope. Still missing something. I bought dental tools, too...you know, in the olden days when your dentist actually made your crown, he used lost wax casting to make it. Some of the best instructions I'd found on the web were vintage videos on YouTube from the University of Michigan Dental School. I don't think they even use those techniques anymore. 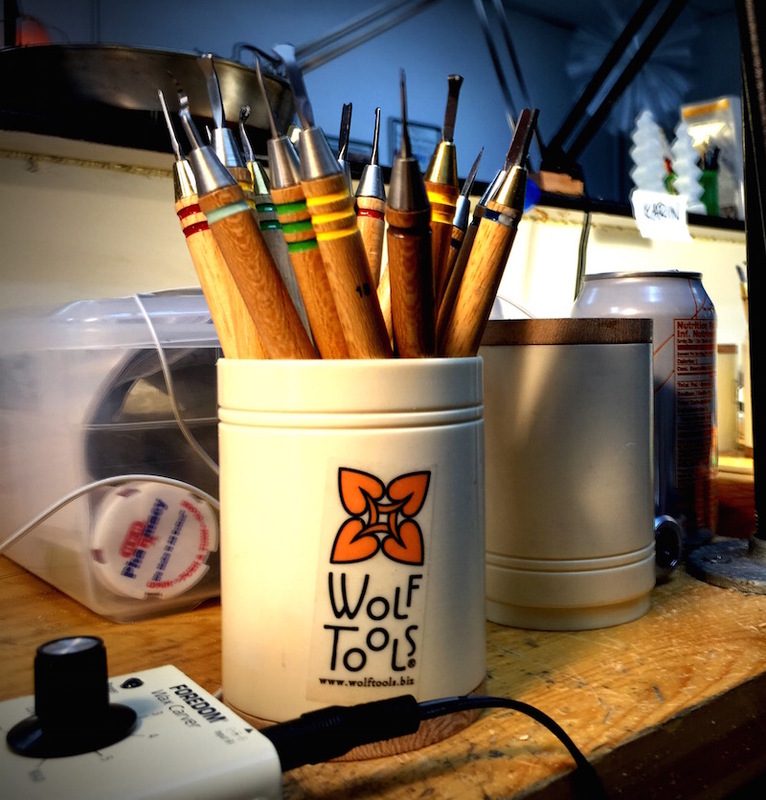 Awhile back, I'd bought a set of beautiful Kate Wolf wax-carving tools, and piddled around with them, but still had nothing really worthy of casting. The blue wax seemed to smudge easily, but the tools were magical. The Wolf Precision Master Carvers kit contains well-made, quality tools...there had to be something I was doing wrong! I'd tried to get into a class of hers in Austin—to learn from the master herself—but they fill up quickly, so I couldn't get in. And then the heavens opened up with an email from Creative Side Jewelry Academy in Austin. There was a cancellation in Kate Wolf's wax turning class. Turning wax on a lathe. I wasn't quite sure what I'd do with it, but it had to be good. I jumped at the opportunity. Heck, I even had a woodturning lathe. But supposedly there was no lathe needed, just a Foredom Flex Shaft, and I had one of those. I could sell the lathe on Craigslist to pay for the other things I might need. After a couple of blissful days turning in Kate's Class, I was a machine! I turned out ring after ring in wax. It was the perfect mix of technical and creative skills, and I was hooked. We made rings, bezels, and some people made little urns. We used those beautiful Wolf Tools to turn the wax. I learned it was more about lightly scraping than actually carving like you would with wood. Pieces were joined, then gaps filled with Touch-Up Wax, which was softer than the hard, golden Wolf Milling Wax. Fascinating. Then I got REALLY lucky. It was storming and there were floods in Central Texas. Someone couldn't make it to Kate's Figure Carving class and canceled! They made an announcement to the group, and I jumped at the opportunity to continue. It was the class I'd wanted to take for a long time. I was nervous, excited, happy...elated! I had NO IDEA what to carve. Many people in the class came in with elaborate sketches and photos. I settled for a flower. Kate had a great handout with flowers. I decided to go for something simple and pay a lot of attention to the details. One looked a little like a plumeria. So I started carving with a new-found appreciation and knowledge of my Wolf Tools. It was delicate work, shaving off tiny bits of HARD wax. Suddenly the different types of wax made perfect sense. When you needed to repair something, you used Touch-Up Wax, which melted at a lower temperature than the golden wax, so your wax pen didn't damage the underlying model. And I also learned that the Foredom Wax-Carving Pen that I owned and didn't like was actually GREAT! I had been using it turned up really hot, which was totally wrong. Lowering the temperature and understanding how temperature is used with wax made it perfect. And the small size of the Foredom makes it really handy to take while traveling.